As much as we all wish we could, for many of us it's just not possible to be with our pups for every meal. An automatic dog feeder can be a great way to ensure that they don't go hungry though, and more and more busy pet parents are investing in one to help keep their pup happy and well fed. Finding the best automatic dog feeder for your pup can be a little tricky though. There are lots of options out there to choose from, which can be a little overwhelming at first. To help you cut through the shopping clutter and make the right choice we spent some time looking at the best selling and best reviewed automatic dog feeders to come up with this list of the very best. Free feeding is where a dog has access to food 24/7 - an owner just fills up their bowl with food and keeps topping it up as and when it gets low. We do not recommend free feeding your dog as this can lead to obesity and a host of other health problems. Along with that, leaving out food means you're inviting unwanted insects, rodents and other parasites which encourages harmful bacteria growth and affect the health of your pet. 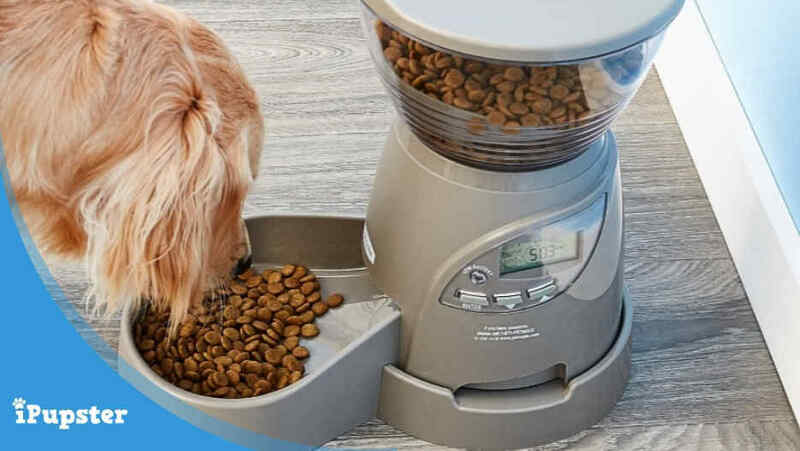 Automatic feeders help eliminate those problems - they work on the premise that food is measured our according to your dog's daily requirement and is dispensed at various intervals during the day to ensure your pet is timely fed remaining healthy and happy. 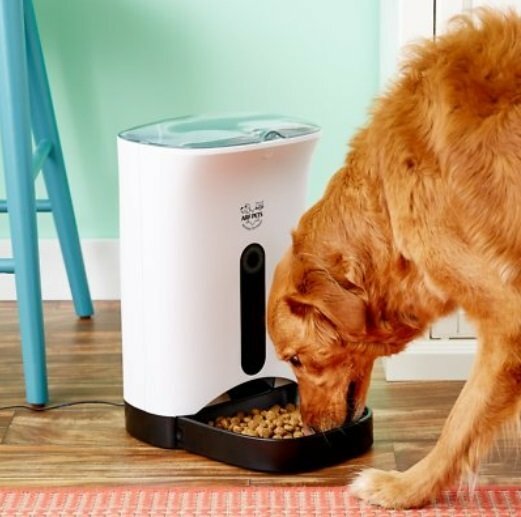 How can an Automatic Dog Feeder Help? Most experts agree: Free feeding is the primary cause of obesity in dogs. It's fair to say that automatic dog feeders do have their critics in certain circles. This is not because they are particularly unsafe, but some people feel that they break the connection between pet parent and pup that is usually created at mealtimes, which can not only be a time to bond but also to teach. However, an automatic dog feeder is not designed to replace that at all. It is designed for those pet parents who have to be out during the day and can't be home to give their pup lunch, or a mid-morning or mid-afternoon snack. Most vets no longer recommend a 'two big meals a day' schedule for any pup, as smaller meals more frequently are usually better for their digestion and better for maintaining constant energy levels. Making use of an automatic dog feeder allows working pet parents to maintain this kind of feeding schedule even when they have to be away. From a purely practical point of view, there is usually less mess and less clean up when using an automatic dog feeder, and if a medical reason requires a dog to be fed at specific times (which is sometimes the case) an automatic dog feeder makes it easier to stick to that schedule too. Larger dogs like German Shepherds, Great Danes, Mastiffs would benefit from a larger capacity dog feeder, like the Petmate Portion Programmable Feeder. This feeder holds between 5 lb to 10 lb of kibble into pre-portioned meals. A smaller dog with a smaller digestive system could probably benefit from a food station that can hold between 2-4 lb of dried kibble such as the PetSafe Healthy Pet Food Station. This dispenser simply refills the bowl when the kibble has been consumed. Finally older dogs require less feeding than a larger more active dog and thus a food station with a lower capacity in their reservoir would be better suited. Petmate is one of the best known names in the automatic pet feeder niche and this model is their best seller. It's sized to accommodate the needs of mid to large sized dogs and offers pet parents the option of scheduling up to 5 lb. or 10 lb. worth of food into pre-portioned meals. One of the advantages of this machine that reviewers mention often is that the LCD programming screen is big and easy to read and the programming itself is very easy to accomplish. Many also like the tight fit of the lid, as that helps ensure that the food in the feeder remains as fresh as possible. One possible downside is that this is a battery only feeder, there is no mains power option. However, according to a number of reviewers the three D batteries it requires, if they are a good quality option like Duracell or Eveready, will last up to 6 months or longer, even if the feeder is used every day. The machine itself, and it's feeding bowl, is crafted from a pet friendly BPA free plastic and it is, reviewers report, very durable. 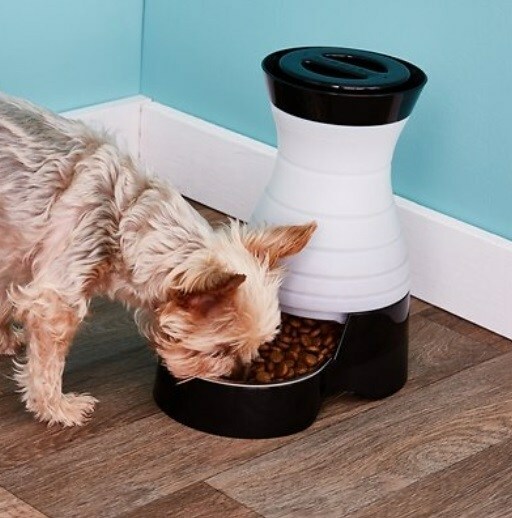 Crafted from stainless steel and BPA plastic this rather sleek automatic dog feeder is, pet parents say, as robust as it looks. 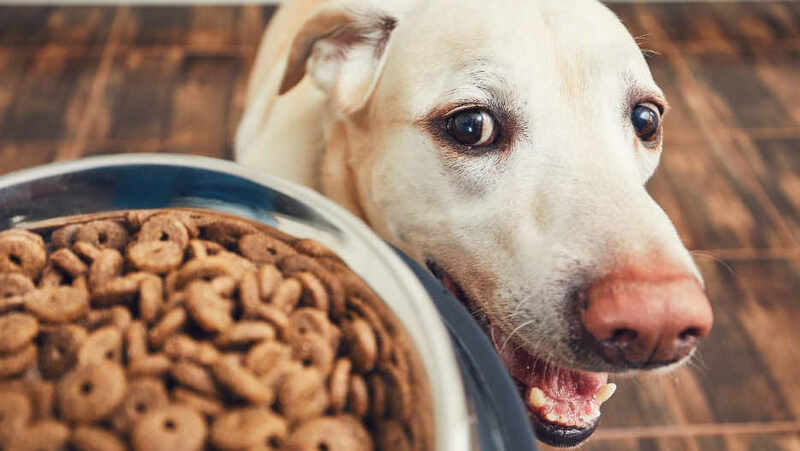 The model designed for larger dogs can hold up to five cups of food in the bowl itself and up to 24 pounds in the hopper, and up to twelve meals can be pre-scheduled and pre-portioned in advance. There is also a slow feed option that will release the scheduled amount of food over a fifteen minute period, something that can be very helpful if your pup has a tendency to gobble down their food too fast. The feeder is can be operated using standard D batteries - four of them - which reviewers report will last up to six to eight months if the feeder is used regularly - or it can be attached to mains power using an AC adapter. Those who have chosen this feeder praise the fact that it is very easy to program - some liken it to programming a coffee maker as the displays are similar - as long as you take the time to read the instructions properly first. Many also like the fact that you can, if you choose, purchase a splitter tool that means that two furkids can be fed in their own bowls at the same time. This feeder is a smaller capacity feeder - it can store and dispense 4 meals a day for the average larger dog and has a capacity in its hopper of 1.4 gallons. It's a very sleek machine (looks great in a contemporary kitchen) and, unlike some automatic feeders its feeding tray is built in. However it can be completely disassembled for cleaning and it cleans up relatively easily, which is always a plus. The Arfpets automatic feeder does offer some extra bells and whistles that some pet parents love. You can record a voice message that is played when the food is dispensed - great for giving a sit command, or just for saying hello - and it has built in 'buffers' designed to stop crafty cats from reaching up and dislodging food. It should be noted that this feeder is particularly popular with the pet parents of smaller dogs and especially cats. It can be powered via D batteries or via a mains power outlet via the AC adapter. Some reviewers do report that it can be a little harder to figure out the programming at first - you really do need to read the instructions, but once you 'get the hang of it' it is, they say, very easy and convenient to use. This is a smaller version of the Petsafe feeder we have already covered, and it is the same in every way except for the fact that it is sized smaller and has a slightly smaller food hopper capacity. It works on the premise that as the food is consumed, kibble in the reservoir will naturally fall into the dog bowl. One thing that reviewers love about this feeder is that it is very easy to manipulate when it needs to be filled. 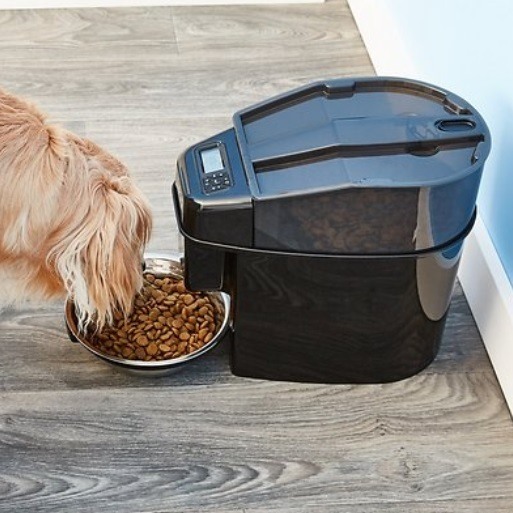 The bowl is made of stainless steel and the dispenser itself holds two pounds of kibble​ for the small size, and four pounds of kibble for the medium size dispenser. While the lids on the food hoppers of other automatic dog feeders can be hard to open and then hard to re-shut properly most of those pet parents who have purchased this feeder report that it is very easy to do both. If you have never made use of one before there's a good chance you have more than a few questions about automatic dog feeders you would like answered before you purchase one at all. Here's a look at some of the most commonly asked questions about these handy mealtime helpers and the answers to them that will help you become a better informed buyer - and user. What are Automatic Dog Feeders? In this case, the name really does say it all. 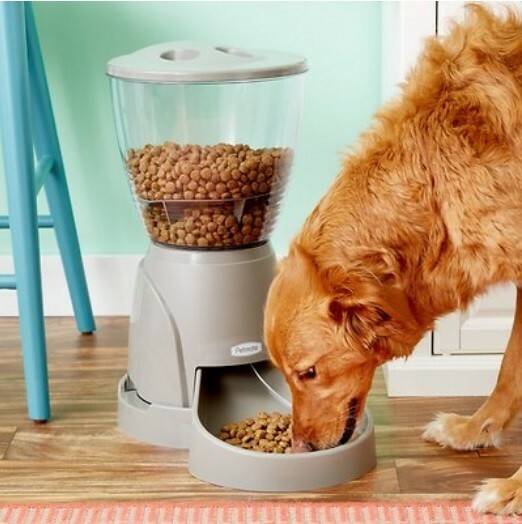 An automatic dog feeder is a machine that can be filled with your pup's favorite dry dog kibble - or treats if you prefer - and then programmed to disperse it in a set amount at a set time. Some automatic dog feeders do this electronically, some do it via gravity but the idea behind them all is the same; to ensure that your pup is given the ideal amount of food, at the ideal time, even if you are not around to feed them yourself. How Do Automatic Dog Feeders Work? As we just mentioned, the actual mechanism that automates feeding does vary from model to model. In the case of fully automated electronic dog feeders the workings are similar to that of an automatic coffeemaker; a software program controls the timing and the release of the food. Gravity based automatic dog feeders are much simpler. They do not have a timer and most have no electronic component at all. The way they work is that after a pup has finished a mouthful of food and emptied the bowl a little more falls down in its place. This will continue until the feeder is empty. Can Automatic Dog Feeders Be Washed? All automatic dog feeders can be washed to a certain extent. Those that contain electronic elements can obviously not be safely submerged in water but the essential elements - food chambers and feeding bowls, can almost always be removed and washed. Are Automatic Dog Feeders Battery Operated? A gravity feeder, as it has no electronic component, needs no power source, but those with electronics do and most of them can be powered from the mains, via batteries or, as is the case with some higher end options a combination of both. What type of battery is needed will also vary from model to model, but the majority do operate on standard D batteries which are very readily available and relatively inexpensive as well. Can They Also Be Used for Cats? Some pet parents do choose to use an automatic feeder for their feline furkids as well. As cats tend to be pickier eaters however this is not always as successful as it is with dogs, but some cats do seem to take to the idea. As cats are far more independent creatures - they don't need to be walked and are often quite content with just their own company for longer periods of time than many pups are - they can be left alone for a little longer (but no more than 48 hours is what most vets recommend) and by making use of an automatic feeder cat parents can make sure that Fluffy is well fed even if they decide to go out of town for the weekend. Are Automatic Feeders Ideal for All Types of Dogs? The best automatic dog feeders allow pet parents to very carefully regulate how much food is dispensed and when at each and every meal time. This does mean that they suit most dogs, even those that prefer to eat several times a day. Some pet parents do find that their pup is initially resistant to the idea of an automatic feeder at all. Most do get used to it after a few days, but if they do not it is not worth risking their health and the feeder should probably be retired from regular use. Can You Use Your Own Bowl? The answer to this question depends upon the type of feeder you choose. A gravity feeder can often be used with any bowl, but in the case of electronic feeders often the bowl has to fit exactly in order for it to function properly, so by switching the provided bowl for one of your own you may risk the feeder failing to operate as it should. Are Automatic Dog Feeders Dog and Cat Proof? However the best automatic feeders do have mechanisms in place to prevent this as far as possible and in regards to chewing, higher end automatic dog feeders are designed to be very chew resistant, especially when it comes to the bowl. Can Both Batteries and Power be Used Simultaneously? Again, this will vary from model to model. Make sure you read the specs and instructions on the models you are considering to understand just how its individual power needs are met.